American Zombie: DHECC - Samples? Possibly....Random? Not likely. DHECC - Samples? Possibly....Random? Not likely. 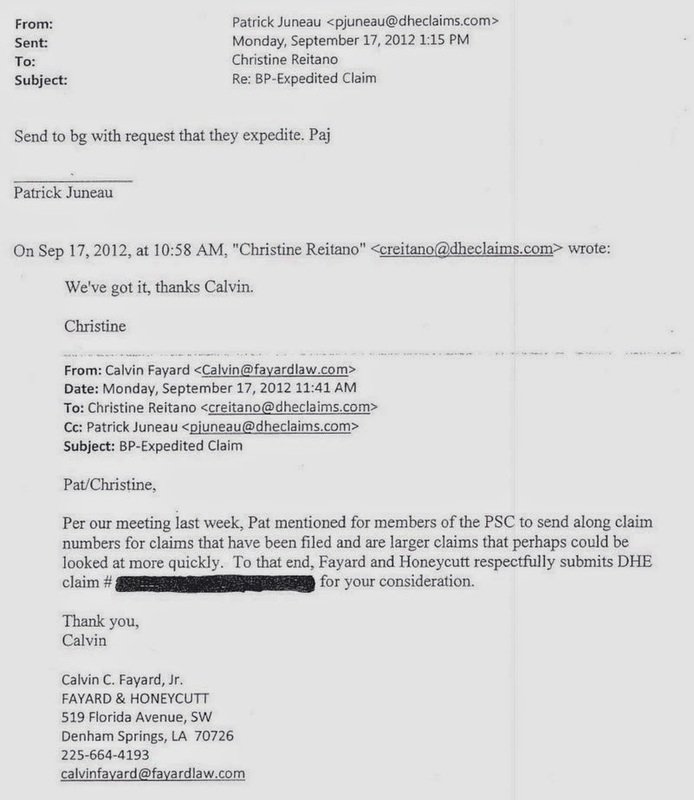 Last Friday I received a tip from an anon that the blacked-out claim on the email from PSC attorney Calvin Fayard to Christine Reitano is for a company called Fab-Worx in Hammond, LA. This is of great importance because Fab-Worx just happens to be owned by Fayard's cousin and business partner in multiple businesses, Robert A. Maurin, III. 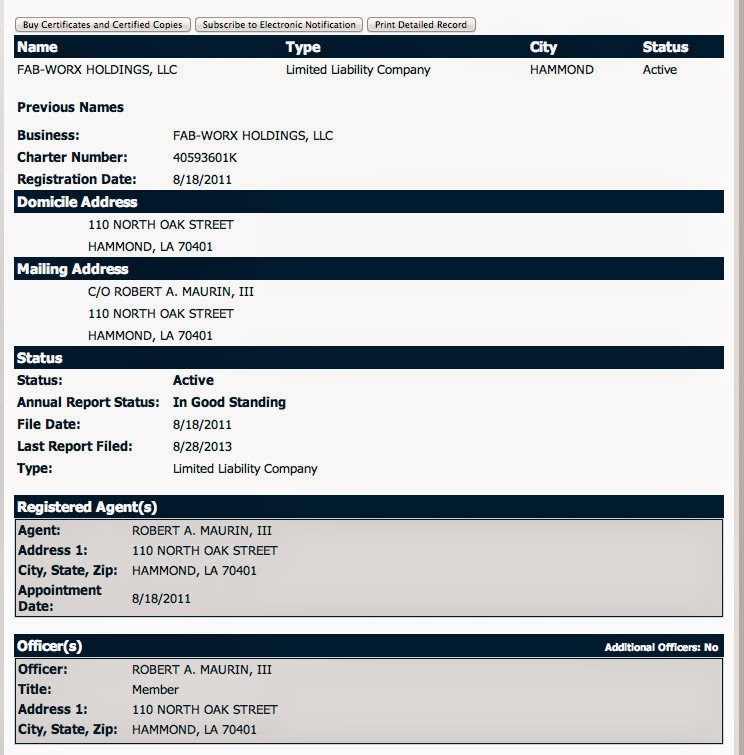 While I haven't been able find any direct ownership on Fayard's part with Fab-Worx, the company name has multiple filings with the Louisiana Secretary of State and I'm unable to ascertain which company with "Fab-worx" in the name may have filed a claim with the DHECC. 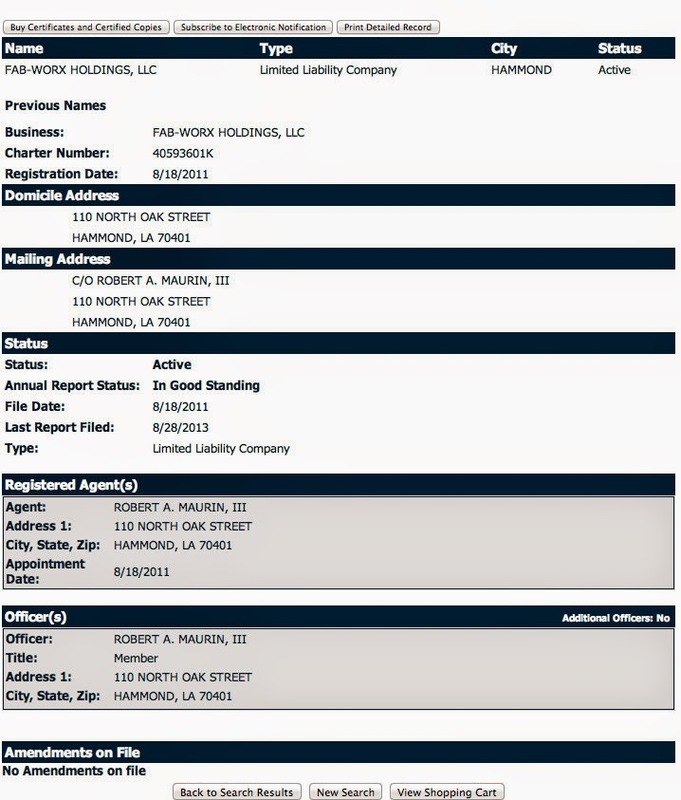 There is a Hammond-based Fab-Worx Holding, LLC that was registered in 2011 which would put the company's incorporation date after the Deepwater Horizon accident and nullify their ability to file a claim but then there is another filing called Fab-Worx Properties, L.l.C., that was registered from a Baton Rouge location in 2008. I am slowly uncovering multiple business ventures between Calvin Fayard and Robert Maurin, as well as ventures between his daughter and lawyer at his firm, Caroline Fayard, and Maurin. The fact that Fayard had this particular claim expedited calls into question Patrick Juneau's explanation that the claims listed in the email chain were being used as part of a "sampling program". If that's the case, and this blacked-out claim is indeed Fab-Worx, then we can assume the "samples" chosen were not random. Unless Fayard randomly plucked his cousin's claim out of a hat. Hello, my name is Jason Berry and I am the investigative journalist who authors The American Zombie blog here in New Orleans, La. As you may know, I have been writing about issues that have occurred within the Deepwater Horizon Economic Claims Center since it’s inception, particularly specific members of the attorneys appointed as class counsel to the settlement, the Plaintiff Steering Committee. Recently, I posted a report based on information I anonymously received in the mail that confirmed an allegation I have been researching for over a year that the PSC members had expedited their own claims ahead of other class members’ claims with the knowledge and consent of the the Claims Administrator, Patrick Juneau. “In response to your recent inquiry, we thought that you should be made aware of the actual facts. In the fall of 2012 the DHECC Program was fast approaching the fairness hearing and the opt-out deadline. To avoid confusion as to who should opt-out versus who should stay in the class, it was important for the class as a whole to have a representative sample of paid claims across all of the claim types in order for them to assess which was the better path forward for them. This could not be accomplished in the time required using the first-in/first-out (FIFO) method outlined in the Settlement Agreement, which method had been used for the summer of 2012, because many of the claims were incomplete and therefore not ready for processing. After discussion with the Court, BP and the PSC, it was determined that a larger number of claims should be examined before the fairness hearing so that the Court, the parties, objectors and claimants could see how the settlement program was working. As noted above, since the program had encountered problems with a lot of the claims not having complete documentation it was difficult to come up with claims that could be analyzed and determined, so a sample of sufficiently documented claims was needed. The Claims Administrator, with the knowledge and input of the PSC and BP, asked the PSC to provide a listing of such cases and a sampling was taken of those cases. This action had nothing to do with trying to expedite a claim for any particular attorney or party. Pursuant to that request, claims were submitted, a sampling taken and determinations were made, and those results were made available to the Court and the parties at the time of the fairness hearing. During this same time frame some of the objectors were taking the position that in order to be able to determine whether or not to opt out, they needed to see at the time of the fairness hearing a determination on the type of claims they were handling. We therefore took samples of claims from the several of the objectors and made determinations which were also available at the time of the fairness hearing. It is interesting to note that over 60% of the claims that were considered were not represented by the PSC. “BP was aware of efforts by the Claims Administrator in the Fall of 2012 to get the CSSP up and running, including how to make the claims process more efficient and, correspondingly, increase the amount of claim payments in advance of the final approval hearing in November 2012. Judging from Mr. Morrell’s response, it appears BP may not have been aware that the PSC attorneys and Mr. Juneau had expedited their own claims as part of the suggested “sampling program”. Since writing this story, another matter has been brought to my attention which I believe is great cause for concern regarding the ethical matters of the expedited claims. I have been told that the claim Mr. Calvin Fayard had expedited in the email, with Mr. Juneau’s knowledge and consent, may have been for a construction (it may not be construction depending on which company filed the claim) company owned by Mr. Juneau’s (I made this mistake in the original letter but sent a corrective letter shortly after) Mr Fayard's cousin, Robert A. Maurin, III. The company’s name is called Fab-Worx and is based in Hammond, LA. Please note, there is no mention of a “sampling process” in this email exchange nor have I been able to find any mention of this process in the Fairness Hearing transcript which occurred in November of 2012, one month after the above email exchange. As a reporter, I do not have access to claimant information and as the claim number was blacked out in the documents I received, I have no way of verifying if the above claim was indeed for Fab-Worx. The fact that this may have been a nepotistic effort for Mr. Fayard to enrich his own relative and possibly even himself by expediting his cousin’s claim is of profound importance to the public. I believe the matter deserves investigation on your part to ensure the claims process is being run equitably. I trust you will pursue this matter as vigorously as you did the Thonn claim which involved the Andry Lerner Law Firm, Lionel Sutton, and Christine Reitano. I trust this information will help you in your investigation into the problems occurring within the DHECC and you will pursue this matter as vigorously as you did the Andry/Lerner, Sutton, Reitano, Thonn matter. Thank you for your consideration and please contact me if I can be of assistance on the matter. I am still researching the web of companies tying the Fayards and Maurin together. I would like to ask any anon. who may be able to identify the claim number blacked-out in the email or any anon. who may have direct information identifying which claim Fayard had expedited, please email me or make an anonymous comment with the information. In his own words: Amen Brother! Whenever you make positive ID on the specific LLC, you're going to want to peel back all the layers of that LLC, its managers, it members, its "agents" (not "agent for service"); its holding companies, etc. Much of this info won't be in the public domain. Use the name Carolyn Mistoler in your searches for Fayard/Maurin LLCs, etc. 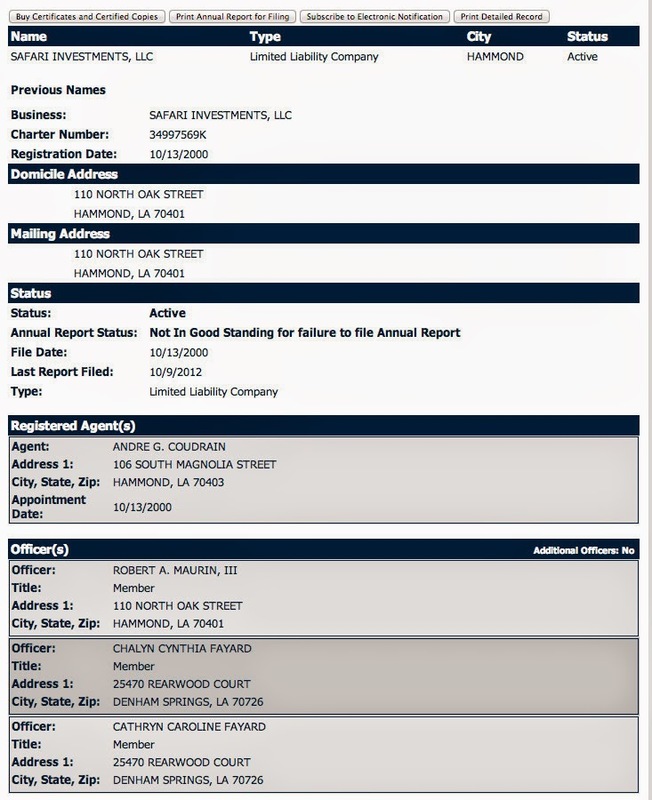 She's Fayard's bookkeeper and her name appears on numerous LLCs with familiar addresses. 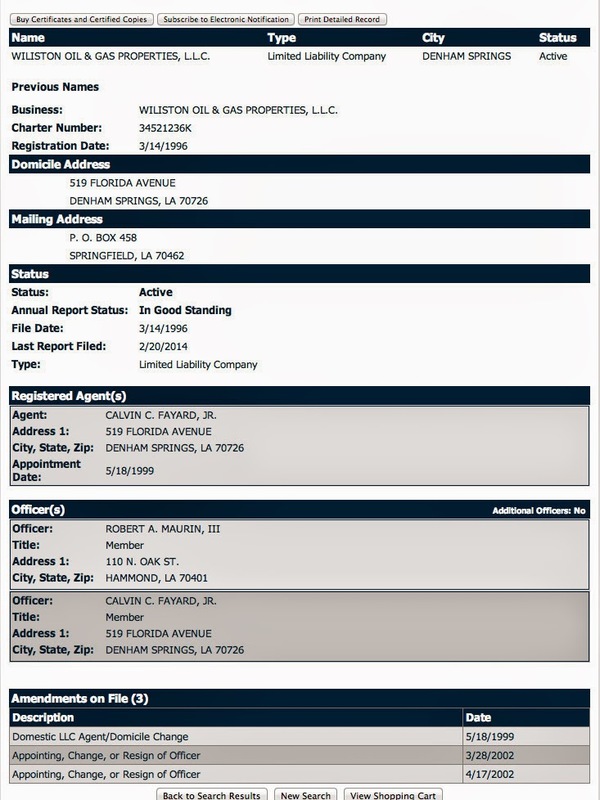 What is striking me as interesting is the number of oil/gas related companies Fayard is associated with. He's a guy that sues O&G on a massive scale and he himself has businesses in the industry. Fascinating stuff, eh? Might want to take a look at this. Let's not descend into a partisan morass. I'm fully aware of the campaign issues and linking to that ultra-right wing babbling blog is not cool. Yeah...you right....it's totally relevant. I just really hate The Hayride...it's almost as nauseating as Varney. Typo sb: "Fab-Worx Holdings LLC" not "Fab-Worx Holding LLC"
Fab-Worx Fabricators is in Pt Allen and is in the construction industry. That raises 2 red flags: causation and matching. Recent BP filings would seem to question how a Fab company in BR could have been affected by the spill, and were revenues and expenses matched. Construction industry claims have been enjoined off and on for over a year so we know that the expediting really benefited the claimant even if there were no matching issues. But what if there were? Did BP appeal that issue? Or did they consent to the expediting AND the non-matching. It would seem to be important for the public to know that BP consented to expediting a large construction claim for the relative of a PSC member just for the fairness hearing and then moved to enjoin the same type of claims for the rest of the class one month later. What if BP did not know. In that case, you have the Judge, CA, PSC triad improperly expediting a claim that would have had substantially less value one month later. If that really happened all 3 should resign. Immediately. And what is the Special Master's position here. Is he going to file a claw back claim against this connected claimant that got a claim paid only because it was improperly expedited or is he going to stick to going after the shrimpers whose only crime was relying on their accountants to file their tax returns? Nevermind, we all know the answer to that question. The above assumes that Fab-Worx was the claimant and that the claim would have been affected by the recent matching rules. The only way we will know for sure is if the judge grants Lerner's discovery request. Sadly, I think we all know that answer too. Trying to prove that Pat Juneau is incompetent or corrupt is a fool's errand.